Chocolate chip cookies are as American as, yes, apple pie. No joke. 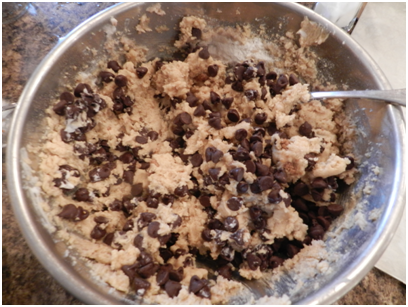 The classic chocolate chip cookie is absolutely American in origin. It was invented by Ruth Wakefield in 1924 at Framingham State Normal School in Framingham, Massachusetts. 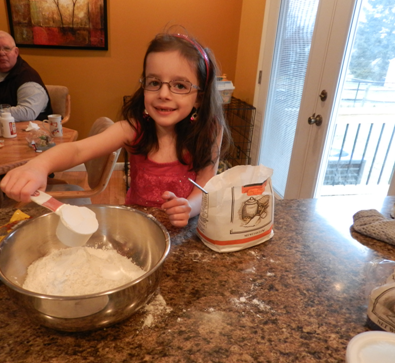 More precisely, Ruth created the original Toll House® Chocolate Chip Cookie. Andrew Nestle tried it, loved it and purchased the right to put the recipe on his packages of NESTLÉ® Semi-Sweet Chocolate Chips in exchange for a lifetime supply of chocolate for Ms. Wakefield! Today my 7 year old granddaughter, MacKenzie, and I decided to make a batch of these yummy delights. I just love that girl. She has such a zest for life and great sense of humor. Whenever we’re together we talk, and talk, and talk..and giggle…and talk some more. Her exuberance translates into an over-the-top love for CHOCOLATE. 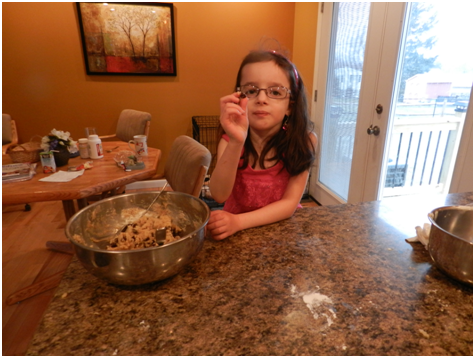 It’s fun to make chocolate chip cookies with her. Since MacKenzie has some food intolerances, we substituted vegetable shortening for butter in the recipe and many of us think it makes it taste even better! Recipe below. Think there are enough chocolate chips in there? Official “chocolate chip taste-tester,” Kenzie inspects the morsel. It is delectable and there’s one less chocolate chip in the bowl. …with a few less chips! Beat shortening,sugars (granulated and brown) plus vanilla extract in larger bowl until creamy. Add the two eggs, one at a time, beating well after each addition. Beat in flour mixture, gradually. Stir in semi-sweet chocolate chips and nuts (if using them). BAKE for 9 to 11 minutes or until lightly brown. 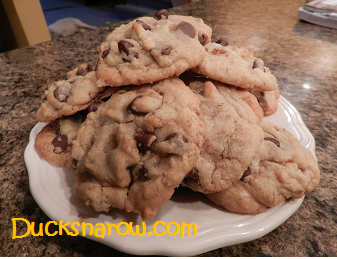 Which kind of cookie do you prefer: non-stick, air bake or something else? Feel free to share your tips and your links.